We know that there are lots of questions which must be hitting your mind right now. But don't worry as you will get the answers to all your queries in the below article soon. Here, we will discuss the Excalibur Dehydrator Timer vs. No Timer in detail. After reading this information, you will inevitably decide that which dehydrator you need for your home and family. ​The Excalibur dehydrator with timer cut the power automatically once the time of the machine gets up. You don’t have to worry about switching off the machine. It also helps in saving your electricity. ​Once you switch ON the timer of the Excalibur dehydrator and do it's setting as per your need, then you don't have to stand nearby to the appliance at all. The machine will get OFF on its own once the time is up.You can do any of your other jobs or work simultaneously without looking at the machine. In fact, you can also use these machines during the night time at the time of sleeping without disturbing your sleep. ​Once you set the right time for drying the food in the Excalibur dehydrator, the machine will get off accordingly. For example, the foods like spices and herbs need less time for drying in comparison to the foods like jerky or meat. If you don't have a timer, then it might make the food under-dried or over-dried. In fact, this can also make the food less delicious and without the right texture. ​The timer in the machine allows you to have complete control over the Excalibur food dehydrator. You have to set the time as per the nature of the food you want to dehydrate. The manufacturer provides the details regarding the drying timings of the different foods inside the instruction booklet. You can just read the details from there and fix the time as per the instructions. Nothing in this world arrives flawlessly. The Excalibur dehydrator with timer also possesses some disadvantages. But these flaws of the products do not overshadow its numerous benefits at all. So, let's have a look! ​In comparison to the Excalibur dehydrators without the timer, the cost of the Excalibur dehydrators with timer is high owing to the presence of the timer. In fact, if you buy the timer additionally from outside then, it will incur you less cost. So, people who are budget conscious do not go for these dehydrators.There are some food dehydrators of the Excalibur brand that comes at the reasonable price with the timer, but they lack the hi-tech features of the other models. ​There are different ranges of the timer that comes in the Excalibur food dehydrators, for example, 26-hour timer or 48-hour timer. Thus, it is imperative that you have complete knowledge about your requirement of the foods. We mean to say that you should know that which type of foods you want to dry in the machine and how much time they will take at maximum.If some food needs 48 hours for drying and you have purchased the dehydrator with 26-hour timer then, it will be of no use. We hope that now you are familiar with the advantages and disadvantages of the Excalibur dehydrator with timer. It's time to tell you about the benefits of Excalibur Dehydrator without the timer. ​The cost of the Excalibur dehydrators without the timer is less in comparison to the Excalibur dehydrators with the timer. Since there is no additional feature of the timer in it, the overall cost of the product also gets lessen. So, people who have a low budget for buying Excalibur dehydrators can go for this option. ​Unlike to the Excalibur dehydrators with timer, in these dehydrators, you don't have to worry about ant range of setting the time. It means any beginner or a newcomer can effortlessly use these machines without any guidance. ​During the dehydration process, you have to keep an eye over the whole drying process. It is a big drawback for all those people who are working or have a busy life throughout the entire day. You can't do any other work stress-free during the dehydration process. If you use it in the night time, then you have to wake up several times for knowing the status of the dried food. ​Unlike to the Excalibur dehydrators with the timer, you have to switch these dehydrators manually as soon as the drying process gets completes. It also means that if you don’t switch off the machine then, it will continue to consume your electricity units. In the Excalibur dehydrators without a timer, there are quite high chances of over-drying and under drying the food. If you somehow miss the timings of turning OFF the unit at the right time then, it can create a big problem for you. The foods like herbs and spices need less time for drying, and if you dry them for more time than the required time, then it can result in the over-drying of such foods. You have to be very alert while using such Excalibur dehydrators. You don’t have any control over the machine without setting the right time. It will work the way you use it. If you forget to shut it down on the right time then, it will carry on doing the drying process until you stop it. If you are a beginner and do not know the working of the food dehydrator then, Excalibur dehydrator without the timer can be a massive burden on your mind. You have to get all the complete knowledge about setting the right time of a particular food otherwise the food can get over dry or under dry due to your small mistake. 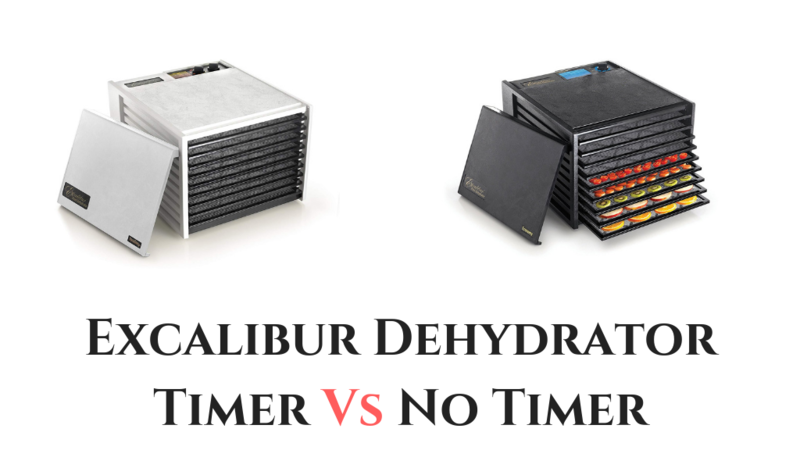 Here we reach the final destination of our informative article “Excalibur Dehydrator Timer vs. No Timer”! We wholly convinced that now you are fully aware of the comparison between the Excalibur food dehydrators with the timer and without the timer. Both of them have their advantages as well as disadvantages in one or other way. People who have constraints regarding the budget can go for the Excalibur dehydrators without the timer but if you don’t have that limitation then opting for the food dehydrator with the timer is a much better option according to us. You can also buy the timer additionally which comes at the reasonable price on the market. Drying food in the dehydrator needs lots of time and attention, but if it has a timer, then it becomes easy for you to carry on your work side by side. So, now you have to select that which Excalibur dehydrator you want to buy for your family: Excalibur dehydrator with the timer or Excalibur dehydrator without the timer? Once you make the decision then, please have a look at the above comparison chart of the five favorite products that belong to each category. You can pick anyone from the table for buying as we select it after doing an extensive research keeping in mind the buyer's needs. If you feel that we skip something in the above article, then please let us know. You can also share your good thoughts as well as experiences with us if you have already bought these food dehydrators. STX Dehydrator vs Excalibur – Which is Best?